Here’s Denis Cooper, with his guest beer blog! 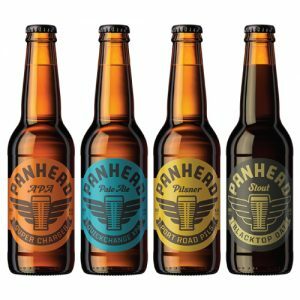 Read all about Panhead beer, and their brews, available right here at Fresh Choice Nelson. With the blossoming of the craft beer industry, it’s not always easy to remember the comings and goings of all the new breweries, let alone the names of their beers! It’s refreshing to have a brewery with a theme for all their brews and in the case of Panhead beer, the theme is petrolheads. The name Panhead was born from a Harley motorcycle engine which had two cyclinder head covers shaped like frying pans, and Panhead’s beers all carry this petrolhead theme. Kick-started in 2013 with four core beers, Panhead’s popularity accelerated so quickly that these beer bogans were recently bought out by Lion Nathan. Not a bad thing as Panhead should be sold wherever Lion Red is sold. Their chief beer mechanic, Mike Nelson, remains on board, engineering these beers along with other hotted-up hop-driven seasonals. Black Top Oatmeal Stout – black as diesel and slippery smooth – at only 5.5 % shouldn’t leave too many skid marks. Tastes of coffee and burnt caramel with a slightly acidic bitterness yet balanced with the sweetness of milky vanilla, leaves you with a cosy warm feeling, much like a heated car seat. Super Charger APA – 5.7 % – the classic American IPA, big, bold and born to be wild. Winner of best beer (SOBA Awards 2015), comprising intoxicating fumes of mangos and apricots with those same fruit essences turbocharging your taste buds. You’ll be blown away by the long driving bitterness. Quickchange XPA – take a load of Fanny with this extra pale ale. It’s the Toyota Corolla of the Panhead fleet in that it’s the reliable go to beer and hits the spot. With notes of citrus and a tangy bitterness it’s easy to imbibe and with a low octane of 4.6 %, you can cruise all night. Port Road Pilsner – 5.2 % – Port Road Hutt City is home of the longest running street drags in Australasia. This pimped up pils has strong refreshing grape skin and bready qualities, with a long running bitter finish. Race on down to Fresh Choice, Nelson and get ya motor running!